We have sad news for fans of the inventive thriller Da Vinci’s Demons, today. While Starz has finally announced that Season 3 will be returning to the schedule this October, the announcement also comes with bittersweet news. Da Vinci’s Demons will officially be ending after Season 3. Despite the cancellation news, fans will still be getting new episodes of the drama fairly soon. The network released the news along with the first trailer for Season 3 on Thursday, also noting that new episodes will hit the schedule on October 24. You can take a look at the upcoming season of the Tom Riley-led drama, below. Da Vinci’s Demons has always had some dark and violent moments, but Leonardo Da Vinci has often been a cheeky and questioning character on the Starz series. In the new trailer, however, his weapons and innovations are being used for mass destruction, and the stakes seem to be a higher than usual. 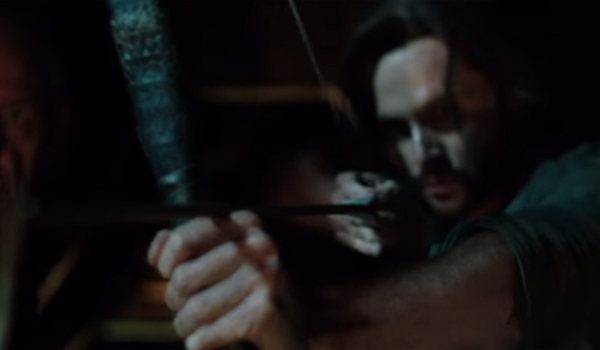 He even looks pretty badass for a second at the end of the trailer, pulling out a bow and arrow doohickey and channeling Arrow’s Stephen Amell. Maybe it’s just a particularly good trailer, and maybe it will be an extra-dark season of the David Goyer drama. Starz has so many new programs on or headed to the schedule that Da Vinci’s Demons sort-of got lost in the shuffle. From shows like Survivor’s Remorse and Outlander that are heading into second seasons to shows in development like American Gods and shows primed to premiere, like Ash Vs Evil Dead, there's a lot to look forward to. Starz is getting more and more popular all the time, and with all of the good stuff coming up, it’s easy to forget that Da Vinci’s Demons has not actually been a part of Starz’s schedule for quite a while. The last time we got new episodes was way back in the spring of 2014. The last brand new episode aired in May of 2014, in fact, making it nearly a year and half between seasons, which is unusual for subscription cable. Still, thanks to the new additions and the fact that Outlander is also being shifted to 2016 rather than premiering in late summer, I’m a little unsurprised about the scheduling changes. Still, do be sure to give Da Vinci’s Demons a watch when it premieres on Starz on October 24 at 8 p.m. ET.